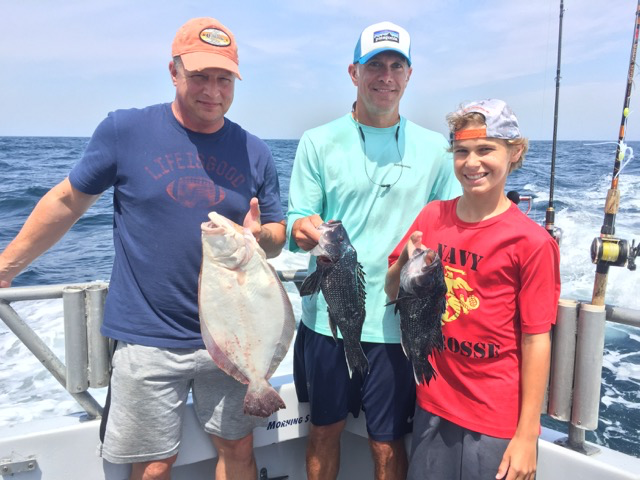 Summer 'We'll Fish For What's Biting Trips' .. Might be flounder, might be sea bass, might be a mix. (Mostly Sea Bass!) If you absolutely have to have one and not the other, don't reserve! 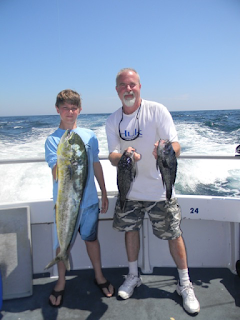 Sailing Daily - Weather Permitting - (Been mostly sea bass. Nicking a few flounder some days too..) Saturday's 6:30 to 3:30 - $125.00 – Otherwise 7 to 3 at $110.00..
Sunday, July 23, Buy two tickets - get a spot free. This is NOT an offer for any other day - just the 23rd. Last year I was trying to think of how regulars could invite a friend or bring a child/grand-child on a day I'm not booking. Worked. It's especially important new anglers are aware of motion sickness preventatives. Being sick all day is no fun at all.. Crossed the 18,000 mark with reef blocks on Saturday, July 8th. Dropped those blocks at Jeff Bauer's "Saint Ann's Reef." Keep thinking I'll have a tale to tell about a wonderful flounder bite. 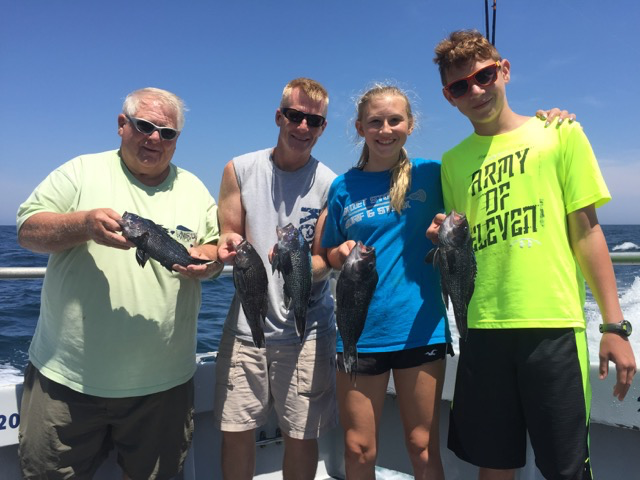 A summer sea bass bite has kept most clients busy with an end of the day fish fry. Not great fishing, but not bad either. At least most days.. I think flounder are here. Just need them to put on the feed bag. Be glad if that were tomorrow! The ship, Shelia Bordelon, departed July 13. I thought it was over*. Now it's back again. We have been told it is routine Navy dive training. Sure is a long way from Little Creek, VA.. There are scores of wrecks between our reef sites & the Chesapeake - all available for routine diving. Lot of money too for the Navy to charter a ship. You'd think they have a few. Before departing the ship had set up shop atop an artificial reef Senator Mikulski helped us get back in the 1990s. It stayed there for 4 days. I do not think they were running survey equipment - especially the sub-bottom profiler. Today, July 16th, the ship is back in the same position -- atop the same artificial reef. You can see it plain as day from the inlet. After departing the Queen Reef in early July and then returning to our area again, on July 6th I saw the Shelia Bordelon on station north of the Manhattan wreck about 30 miles north of the Queen -- offshore the MD/DE line. I fished nearer & nearer to them. There was no effect on the bite. Apparently they had ceased running their sub-bottom profiler. On June 29th, however, that was hardly the case. That day they were blasting whatever noise they make. I had to run over 10 miles to escape the affect of their gear. Many boats have reported similar findings at the Queen Reef. MD's nearshore reef complex is in a very bad way. If the Navy's trying to win hearts & minds of local fishers - FAIL. I am trying to get NOAA & others interested in the sub-bottom profiler's affects on fish. I am also going to try and make certain this "routine dive training" goes somewhere else next year. We've suffered their business quite enough. This part of the ocean needs to get real quiet for a while. I'm not kidding in the least. Black sea bass & flounder have been pushed off habitat -- sea bass even in spawning season -- quite enough. We could not begin to guess what other affects the past 5 years of survey sounding have had. My thinking is that the 2013/14/15 Wind Energy surveys; surveys that lasted months & caused sea bass and flounder to evacuate 500 square miles in & around the MD Wind Energy Area; (WEA) those big impactful surveys sensitized our reef residents. When the Bordelon came in August 2016 and started blasting a sub-bottom profiler just 10 miles SW of the MD WEA, fish got the heck out of there. This year fewer fish returned to the Queen & Bass Grounds reefs. Then, when the Shelia Bordelon returned yet again (and told me they were running a sub-bottom profiler) sea bass just seemed to evaporate ..and flounder remain scarce. To my knowledge, and my direct experience with radar during 100% certain sub-bottom profiler influenced fishing, the sounder's affect on sea bass/summer flounder feeding positively carries at least seven miles. As the source gets closer, the effect intensifies. At two miles or so you cannot get a bite with a sub-bottom profiler running. I used to be able to fish the Queen Reef several times a month with plenty of people aboard. NOAA, NMFS, Navy, & MD DNR ought to have a little chat about that.. Probably won't though. Just one more failure in a system of fisheries management willing to embrace the absolute falsehoods of MRIP recreational catch estimates, while discounting any ecology or biology that might be brought to the fight. Go ahead and spend a couple hours googling our natural coral reefs from 10 fathoms to just inside the 100. Ain't any..
And they're crucial to our fisheries. A victory in habitat - a solid win. I spent a lot of years beating up on "oyster shell" as a reef material. Big-big money spent on shell. No one could point to a reef, any reef, and say, "We restored that reef with shell." Spat on shell/put & take oystering like a freshwater pond with stocked trout? Yes. Shell works for commercial oystering purposes. But big shell piles creating a live reef that grows annually? No. But in these first large-scale rock reefs -- major success. There is no more mystery of how oysters can be restored. In just a few years after rock was dropped on the bottom - incontestable evidence that we can restore oyster reefs. Rather than a few lonely voices winning this argument that shell was ill-suited to actual Reef Restoration, our region just ran out of oyster shell and started using rock. Where decade after decade of failed oyster restoration has allowed even the ocean to turn green; today we can see Big Rock Oyster Reefs will one day equal Blue Mid-Atlantic Seas. I see it plain as day. Have for a long time. But, of course, like our coral reefs, there's no real science to back my assertion of lost marine water quality. Fishers say there are reefs. BOEM & NOAA, say, yawn, we can't find them. Fishers' tales of billfishing from the time the inlet was cut in 1934, catching white marlin just 4 & 5 miles out, to today's 60+ mile runs fairly screams of water quality loss. Bluewater fisheries, especially marlin, cannot thrive in this algea-laden mess we commonly have out to thirty, even fifty fathoms nowadays. Sometimes green water goes to beyond canyon's edge. No .guv agency has bothered to look at the connection so far as I know. Bet your last dollar -- if a day ever comes when outriggers are lowered and billfish baits run astern just 8 to 10 miles out again, it will be because oyster restoration was successful in the extreme. Lots & lots of life around those reefs. More important than fish & crabs; every oyster is thought to filter 50 gallons of baywater daily. They are our natural water filter. Would that we might see it all flourish. Real fisheries restorations in clean waters with abundant bayfloor & seafloor habitat. Below is a comment I posted about NJ's stunning win over ASMFC flounder regs. Using MRIP to create very real regulation is bound to create civil & regulatory disobedience. Here from Fish Report 5/22/17..
MRIP shows an amazing increase in recreational catch despite the fact NOAA strongly believes fluke/summer flounder populations are down & in need of an across the board quota cut of 30%..
With a population in decline -- and that decline seen plainly in For-Hire catch estimates -- recreational Private Boat fishers are thought to have doubled last year's catch in some places. In other places, catch is reported way down. 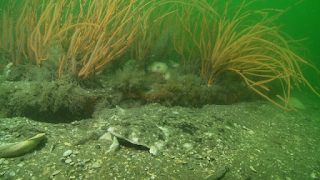 ..while NOAA holds the overall summer flounder population is down. MRIP shows a MILLION more pounds of just NJ Private Boat catch -- increasing to 2,159,000 pounds, catch while NJ's Party/Charter skippers didn't even get to one hundred thousand pounds.. Unfortunately, I initially saw the NJ increase in recreational summer flounder catch as singularly important. In fact, MRIP has several states with huge increases in fluke catch despite a worrisome population decline & an obvious overall coastwide decline in the For-Hire Party/Charter industry. NJ Private Boats' amazing luck in the face of a declining fluke stock is matched elsewhere. Connecticut's Private Boats are said by MRIP to have landed twice as much fluke to nearing 3/4 of a million pounds; while that state's For-Hire fleet landed just 8,000 pounds..
New York's Private Boats were up 800,000 pounds. They increased over 3/4s of a million pounds to 2 million pounds ..while NY's For-Hire boats were down 100,000 pounds to just a 1/4 million pounds total. Delaware's Private Boat summer flounder catch doubled to 210,000 pounds while their Party/Charter For-Hire declined like other states..
Only Massachusetts, Maryland, Rhode Island, & Virginia's Private Boats showed a decline from 2015's landings; and ONLY Massachusetts' Party/Charter showed an increase in summer flounder/fluke landings. It's a number I sincerely doubt.. It is unbelievably frustrating to see catch restriction choking commerce while the real work of fisheries restorations fails to even enter the room. It is unbelievably frustrating to tie my boat up in beautiful weather when I am certain we are reversing early gains in restoration.. Not owing to overfishing, I saw that -- lived it. Today we have an abject failure to use population biology & ecology in marine fisheries management. What winter quotas have been designed to protect regional stocks from overharvest as fish gather from across the shelf to very small areas at slope's edge? What seafloor habitat has even been recognized to exist, let alone calculated in spawning production. From 10 fathoms to 99 -- nothing. The cool habitat beyond the 100? Sure, NOAA gave it everything they have for a few years. Inside the hundred where habitat actually makes a difference to regulated species? Not so much. We've had government sancioned impacts from survey equipment for 5 years straight off OC. Nothing. Nothing. Nothing. A huge area of seafloor completely evacuated - NOTHING. But some dagoned statistical spike that no one ought believe? Management, though I sense growing weary of bad recreational catch data, still embraces MRIP's delusions of catch and strips away more and more of our fisheries as each and every year new statistical spikes make "Overfishing" look like it's still something..
..but not when catch estimates force the manning of trenches - bayonets fixed for every Wave estimate. Do I agree with DOC? No. But no one should be surprised.